How many days during an average week do you find yourself making trips to the hospital or a nearby pediatric therapy office for appointments? What about when a week is busier than “average?” If it feels like you spend the entirety of your days shuttling between home, your child’s school, doctors’ offices, and therapy appointments to ensure your child’s healthcare needs are met, it may be time for a schedule change. And no, we don’t mean to imply you ought to stop taking your child to all of their various pediatric health care appointments! Instead, save yourself time and hassle; bring all of those medical and therapy appointments to your home. So often, people come to think that home healthcare is only for the elderly and those with extremely high medical care needs. This is not the case! Home care agencies like Evergreen Home Healthcare are here to help you out with any in-home health care needs, even if it seems to you like it’s too simple to warrant the help. Home care services can include everything from pediatric therapy for special needs children to personal hygiene or ambulation assistance for an elderly parent. If you feel like you’ve been run ragged trying to get your loved one to appointments—or even if one appointment a week is hard for you to make—talk to your loved one’s primary physician about arranging to have home care nursing services come to you instead. Home Care or Office Visits? You may be thinking to yourself, “my child only needs to meet with the speech pathologist once a week, I don’t need a home health aide.” And, honestly, if you feel like you’re doing well without extra help, then we’re so glad! Bringing pediatric health care assistance to your home isn’t a mandatory thing. However, there are some definite advantages to asking a pediatric therapy provider to come to you, rather than the other way around. So, how do you know when it’s time to seek out a home health aide versus shuttling to and from doctors’ offices each week? Your loved one has a medical issue that needs frequent attention. This can include both acute (short-term) and long-term medical care and helps with an array of different medical needs. The benefit here is that it often means your loved one can come home and convalesce from the comfort of their room rather than an uncomfortable hospital room. Our skilled nursing services can assist with catheter and ostomy care, injections and medicine dosing, and routine vitals monitoring among a long list of in-home medical services. You live outside of the city. If you have a special needs child who has standing appointments every week, it probably takes a lot of careful scheduling to be sure you can make it to every one of them each week—and heaven forbid one of the doctors or therapists asks to move appointments around! 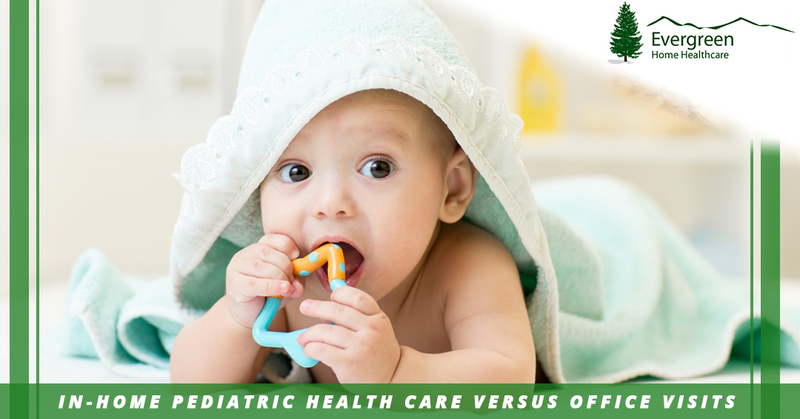 By choosing to bring pediatric health care providers to your home, you can save some time and gas ferrying yourself and your child to all of their appointments each week. Your child’s care needs are ongoing. Many special needs children benefit from long-term or ongoing sessions with a speech pathologist, physical therapist, or occupational therapist—or some combination of the three. When you bring those pediatric health care specialists to your home, not only will your child receive the individual attention that will most benefit them, they will do so in a familiar environment, which can help improve their receptiveness to the sessions. In addition, the therapist can go through your home and make suggestions to aid in your child’s ambulation around your home and teach you additional ways to help your child outside of therapy sessions. Of course, this is not a comprehensive list of situations in which you should hire a home health aide. Every situation is as unique as the individual who needs assistance. Whether you have a special needs child who would benefit from in-home pediatric therapy sessions or your child needs short-term medical care while recovering from a surgery or illness, Evergreen Home Healthcare can provide you with compassionate pediatric health care services in the comfort of your home. Contact us today to learn more!